As corals go, Seriatopora hystrix, the bird's nest coral, is one of the attractive stony (scleractinian) corals that people love to see on the reef. The fact that it has different varieties (is "genetically partitioned") on the northern Barrier Reef, means that for the first time, we can study the mechanisms of the natural selection of their symbiont algae and the corals themselves. In this study by Pim Bongaerts et al in the BMC journal, Evolutionary Biology, transplants were placed in habitats with varied topography on the Yonge Reef, near Lizard Island. The three habitats for the coral were chosen at "Deep Slope", "Back Reef" and "Upper Slope". Analyses in parallel with the transplantations were performed on mtDNA and photo-physiology. After 14 months, native transplants were found to be surviving best, showing a differential in selection while the host/symbiont assemblages were stable. In all 38% of the transplants survived. Shallow and deep transplants had respiration and photosynthetic rates varying, with more carnivorous behaviour in native deeper water transplants (Deep Slope). Basically, very few ecotypes survived outside their own niches. Depth, it was concluded is a prime factor in causing adaptation in the thirty metres of reef studied. The varieties of coral studied were termed "ecotypes" in the study, but no exact point between the varieties is known and habitat (with depth) isolation is still the only selective pressure known to have occurred. Apart from the genetics and growth, the physiology produced results showing that very little photosynthesis from the symbiont algae went on lower in the reef. Despite very successful coral growth in the native transplants, they seemed to be able to use cold water currents and other methods to supply them with their microscopic food, which they can sting. This is typically holozoic nutrition whereas, near the surface, photosynthesis by the symbionts is truly reliant on the light factor. How these ecotypes survive in opposite niches is shown clearly by the almost total lack of survivors during the fourteen months observed. The researchers would have liked to observe how long the transplants did survive, but this was not possible on this study. They decided that the observed partitioning of habitats between ecotypes reflected their divergence along a gradient of depths. This means gene flow is reduced and therefore ecological mechanisms are creating diversification in both the coral and its symbiont alga. 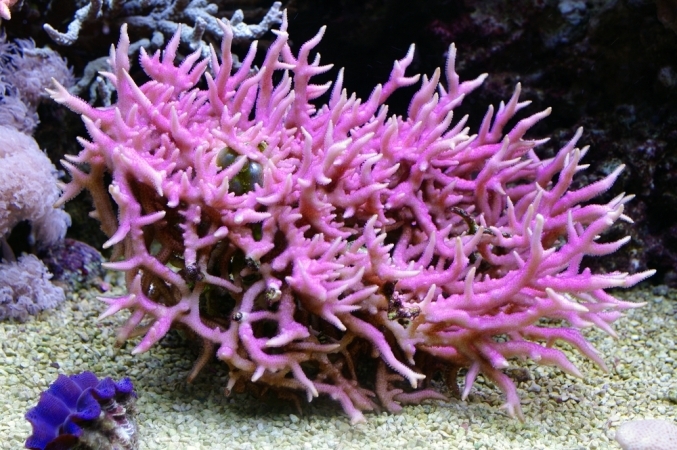 Seriatopora hystrix is a coral with a brooding reproductive strategy; (i.e. eggs develop in the maternal colony and are released as larvae) and is common across a wide range of reef environments throughout the Indo-Pacific as outlined above.